For anyone who saw Paolo Sorrentino’s magnificent The Great Beauty this film will come as no surprise. It will amaze and delight with stunning cinematography, dazzling camera angles, quirky and outré characters behaving in bizarre ways, and a perfectly calibrated musical score. The Fellini-esque references waving like proud banners in homage to the quintessential master of Italian surrealist filmmaking. The architectural eccentricities of the Alpine spa in which the film takes place reflect the character of the guests (one is tempted to call them inmates). It is the perfect setting for a sly and charming meditation on old age. Sorrentino is a bit young to be this obsessed. But he does it so well. Sorrentino wrote this film for Michael Caine. This is the sort of role which would usually feature Tony Servillo, who has collaborated on many of his films. But this being filmed in English necessitated an English-speaking cast and Michael Caine is a perfect fit for the lead. He plays Fred Ballinger, a retired world-famous conductor and composer in his 80’s who is on his annual visit to the spa with his daughter Lena (Rachel Weisz) who is also his assistant. One of Fred’s oldest and best friends, Mick Boyle (Harvey Keitel), a successful Hollywood producer (and the father of Lena’s errant husband) is also there, these two are a study in contrasts. Fred is emphatically turning away from life and shutting down. When an emissary from Queen Elisabeth II comes to ask him to conduct one of his most beloved pieces for Prince Phillip’s birthday he flatly refuses with no explanation. He does not see any point or any future. He has nothing left to prove. Mick, on the other hand, is fully engaged, frantically working on a screenplay for his last important film, his legacy. To that end he has brought along with him a team of young writers to help write and put together a script. Also in the mix is a young actor, Jimmy Tree (Paul Dano), who is preparing for a part in which he will be recognizable as himself. His current fame rests on his role as a robot and the transition is proving troubling. There are an assortment of freaks and geeks, a hugely obese former soccer star, Maradona, Miss Universe, a masseuse with a mysterious inner life, etc. Not very much actually happens but the activities of the guests are filmed with a gorgeous operatic pageantry which is a hallmark of Sorrentino’s directorial style. There is a wonderful scene where Fred conducts the cowbell-wearing cows in the field. And things are revealed little by little. The truth about Fred’s wife which has only been alluded to is finally acknowledged in a heartbreaking scene and it explains a lot about Fred’s ennui. When Jane Fonda appears as Brenda Morel, Mick’s long time collaborator and ace-in-the-hole to guarantee the success of his final film arrives in all of her Sunset Boulevard glory to tell Mick she will not be available for his film she totally steals the scene. The casting is simply genius. 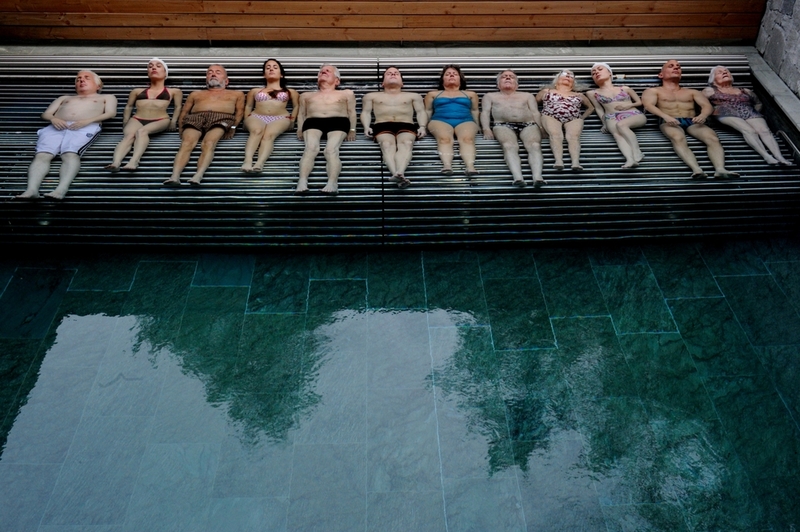 In short, this has all of the elements which we love from Sorrentino - only less of each of them. Less visual density, frenetic energy, musical cacophany, vertiginous camera work. It is more elegiac, minimalist by comparison. There is room to breathe and space between the elements. It is perfectly calibrated to the theme of the film and it too is a great beauty. Haunting and lovely.